The Lori Michiel Fitness team of certified health and fitness professionals look forward to designing your customized exercise program to increase your physical activity and reduce your barriers to exercise. Creating safe and effective training programs for older adults requires a variety of specific skills and strategies. Our knowledge is gained through education, professional experience and everyday life. Our ability to communicate effectively and our focus on personal objectives makes all the difference in our clients’ success. 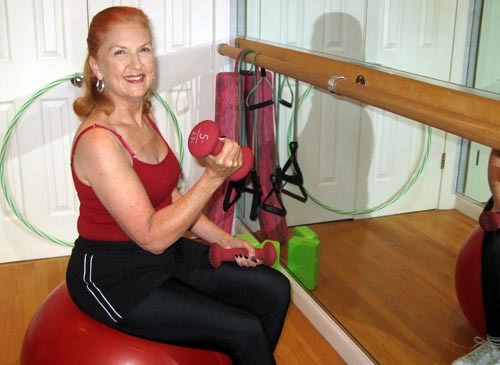 Our visits include a combination of balance training, cardio endurance, muscular fitness, Pilates techniques and yoga movements, you’ll see: significant improvements in your in energy, flexibility, increased bone density, toned and stronger muscles, reduced arthritis symptoms, self-confidence, improved sleep and mood… just some of the results we see every day! Experience personal training at your home or in Lori’s West Hills Fitness Studio. You’ll receive a complete assessment and one full session. Your health history, goals and other factors are reviewed to ensure that the most comprehensive fitness plan is designed for you. Your customized plan will increase your agility, balance and coordination, flexibility, aerobic capacity and muscle strength. And, of course, you will be on your way to feeling better than you have in years! Your preference about scheduling, atmosphere and individual or small group training will all be considered to ensure the most productive and MOTIVATIONAL experience possible. Progress reports can be sent to your physician, family or care provider at no additional charge. Customized programs are available for our post-rehab clients to help boost your progress and avoid relapse. Our trainers are uniquely proficient at instructing safe, integrated programs that allow you to make the most of your life. They are independent trainers, Kinesiology graduates, physical therapists, physical therapy assistants and physiotherapists – all certified by nationally accredited agencies, screened for experience (no less than 10 years), and are sensitive to our clients’ needs. Along with positive and affirming communication skills, they understand when to modify or progress each exercise. After the initial assessment, which takes between 60 and 90 minutes, you have a choice of a 45-minute or 60-minute session (minimum of twice a week). Call us for any seasonal specials or small group rates. Please review our CLIENT POLICY. We accept cash and personal checks. Click here for information about Lori Michiel Fitness gift certificates. We look forward to helping you live life to its fullest – at any age.